Celebrating National Pride Month with none other than the Zoom Fly, Nike wave the rainbow flag with the ‘BETRUE’ pack. 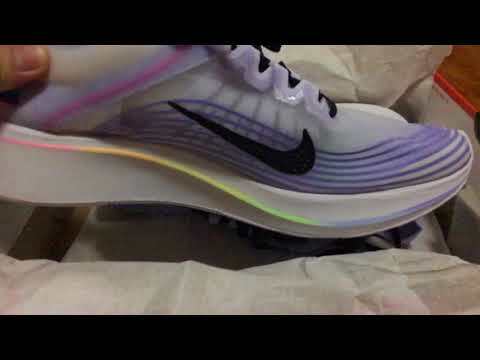 A lightweight cloud decorated in lavender, pink and blue, the Zoom Fly’s translucent uppers represent a clear future for the LGBTQ community; stepping forward with the rainbow flag, while the triangle emblem takes pride of place as one of the oldest symbolic references in LGBTQ culture. Supporting the ride with a reinforced rubber heel, Lunarlon cushioning and a full-length carbon-infused midsole plate, the Zoom Fly continues to perform with a kaleidoscope of colour running along the track lines and midsole base.